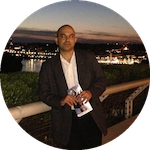 Just 30 minutes away from DC, we will get to experience the fun and vibrant atmosphere of Seville's traditional fair. Flamenco dancers stomping onstage, to the sensuous rhythm of the Spanish guitar. There’s chorizo on the grill and paella bubbling around in the food tents and it wouldn’t be a Spanish party without bocadillo and cold sangría. 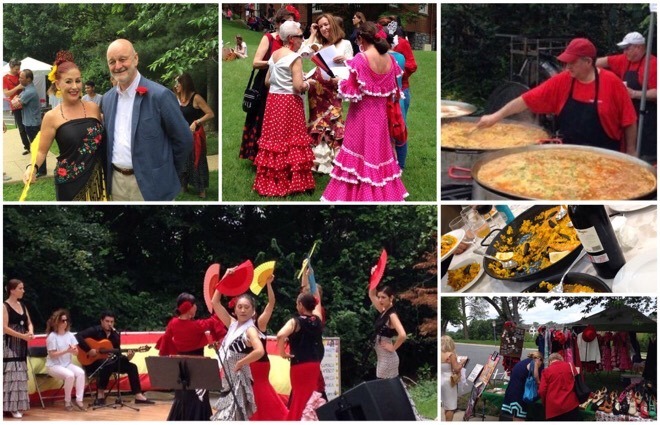 In June of each year the Centro Español de Washington, D.C. organizes the Feria de Sevilla (Seville Fair) in Washington DC. A full day’s events include flamenco performances as well as visiting different casetas (small tents at the fair) in which a few dance schools offer instruction or the opportunity to dance sevillanas and flamenco. Other tents are set up to sell items from different regions of Spain. Some local Spanish restaurants and specialty caterers also serve typical Spanish dishes, such as paella and a variety of tapas. The Seville Fair also known as 'La Feria de Abril' (The April Fair) is held in Andalusian capital of Seville, Spain generally two weeks after Easter. 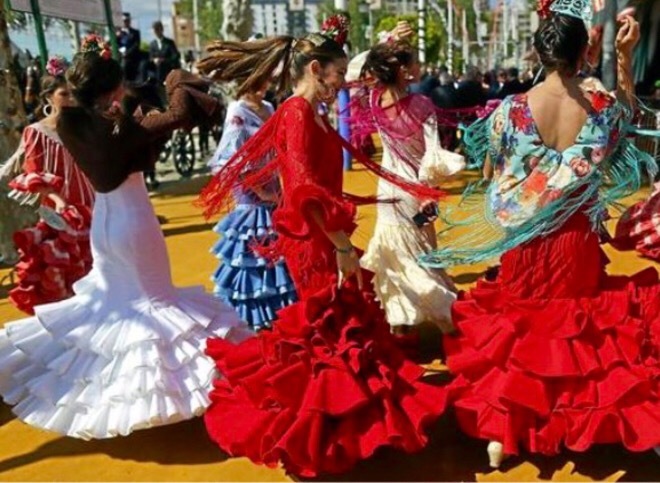 The city of Seville throws a week-long party known as La Feria de Sevilla in which over a million people attend. The Feria is essentially a small temporary erected tarp city where the fair festivities take place for six days. Inside the fair, there are multiple small tents called 'casetas' where people party and socialize. Most of the casetas belong to prominent families of Seville, groups of friends, clubs, and political parties. During the day, the most popular activity includes watching the horseback parades and women wearing beautiful Gypsy-inspired flamenco dresses and the men in their traditional suits known as ‘el traje corto’. The night is the time for drinking sherry and dancing the sevillanas until the sun comes up. The origins of the Fair can be traced back to a cattle fair which took place on the grounds of the Prado de Sebastian in 1847. The fair grew in size as each year a increasing number of tents known as 'casetas' were set up and eventually during the 1920s, the fair became the city’s biggest annual fiesta and the spectacle that it is today. 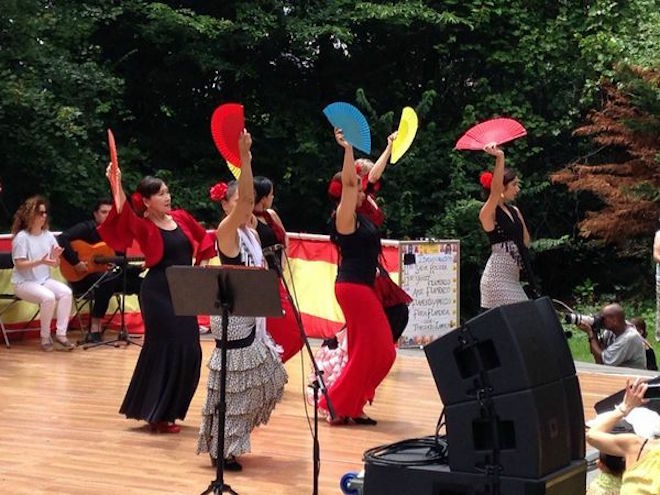 Sevillanas is a variation of flamenco with a difference in the timing, rhythm and style of singing, and the locals are specific about calling it sevillanas, not flamenco. Sevillanas are believed to have evolved from the seguidillas, an old Castilian folk music and dance from the 15th century. It was later influence by the flamenco to become what is, today, the sevillana. Description: In June of each year the Centro Español de Washington, D.C. organizes the Feria de Sevilla where we can experience the fun and vibrant atmosphere of Seville's traditional fair.